TALLAHASSEE, Fla. – Powerful Hurricane Michael closed in on Florida’s northwestern shore on Wednesday with the threat of catastrophic surges of sea water and roof-shredding winds, and the state’s governor said it would be the worst hurricane to hit the region in a century. Authorities told residents along the affected areas of Florida’s Gulf of Mexico coast that they had run out of time to evacuate and should hunker down. A very dangerous Category 4 storm on five-step Saffir-Simpson scale, Michael strengthened as it moved north over the Gulf of Mexico and by 8 a.m. 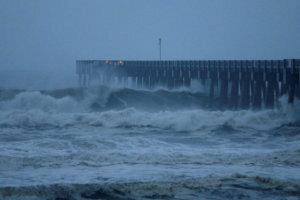 ET (1200 GMT) was carrying top winds of 145 miles per hour (230 km per hour), the National Hurricane Center said. It was set to make landfall later on Wednesday on Florida’s Panhandle and could drive sea water levels as high as 14 feet (4.3 meters) above normal in some areas, the center said. The storm could strengthen further before coming ashore, it said. Michael’s menace was compounded by its relatively quick development, growing from a tropical storm to Category 4 hurricane in about 40 hours. “This kind of sprung up for us quite quickly,” said Andrew Gillum, mayor of the state capital, Tallahassee, which lies about 25 miles (40 km) from the coast and was preparing for a battering. “We honestly felt we might have a tropical system and weren’t sure where it would go and now we’re staring down the barrel of a category 4 storm,” Gillum told CNN. More than 2.1 million residents of at least 20 Florida counties were under mandatory or voluntary evacuation orders. Much of the area is rural and known for small tourist cities, beaches and wildlife reserves, as well as Tallahassee. “Hurricane Michael is forecast to be the most destructive hurricane to hit the Florida Panhandle in a century,” Governor Rick Scott told reporters, speaking about seven hours before Michael was expected to make landfall. Earlier, Scott said on Twitter that it was too late to evacuate the target zone and that people who had stayed should immediately seek refuge. Some of the storm’s most significant early impact was to offshore energy production. U.S. producers in the Gulf cut oil production by about 40 percent and natural gas output by 28 percent on Tuesday, the Bureau of Safety and Environmental Enforcement said. The storm was heading north at 13 mph (20 kph) and was about 90 miles (145 km) southwest of Panama City, Florida, the NHC said. He said the storm would still have hurricane-force winds as it pushed through Florida into Georgia and tropical storm-force winds when it reaches the Carolinas, which are still reeling from post-Florence flooding. Up to a foot (30 cm) of rainfall was forecast for some areas. Among people who had fled their homes was Betty Early, 75, a retiree who joined about 300 fellow evacuees huddled on makeshift bed rolls of blankets and collapsed cardboard boxes at an elementary school serving as an American Red Cross shelter in Panama City, near the storm’s expected landfall. Scott, a Republican running for the U.S. Senate in November’s congressional elections, declared a state of emergency in 35 Florida counties. The last major hurricane, a storm of Category 3 or above, to hit the Panhandle was Dennis in 2005, according to hurricane center data.